In this webcast a panel including Vivian Robinson QC, General Counsel of the UK's Serious Fraud Office, will discuss the importance of putting in place "Adequate Procedures" to prevent bribery and the impact that doing so will have on the SFO’s decision to prosecute, or not. The panel will look at civil outcomes and the possibility that the SFO might take no action against a corporate and/or its directors and officers following bribery being uncovered. We will also examine why putting in place Adequate Procedures to prevent bribery will shield directors and officers from prosecution under the new law. 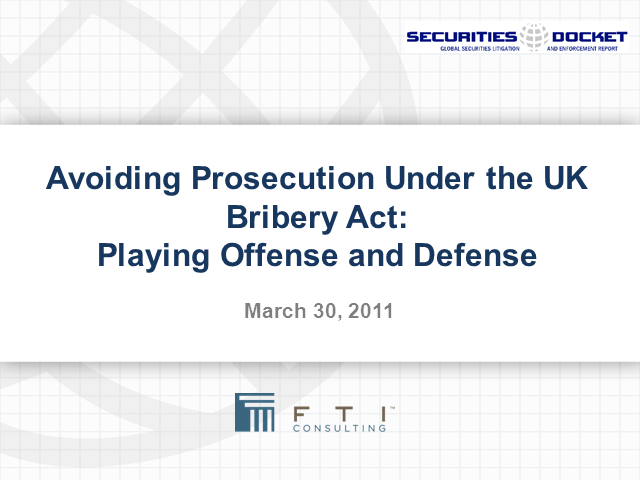 The panel will also focus on the role that the SFO can play in providing comfort to corporations and their advisers when questions arise under the UK Bribery Act in the absence of the type of formal opinion procedure that exists in the United States. Our panel will discuss whether this really is a case of two nations divided by a common language.